The Soviets won the race to place the first space station in orbit. On April 19, 1971, they launched Salyut 1. Two years later, on May 14, 1973, America responded by launching Skylab. Both space stations shared the modest objectives of studying the effects of long-duration spaceflight on the human body, photographing Earth and the rest of the solar system, and preparing the way for a dramatically improved next generation of space stations. Everyone involved in these projects had much to learn. Engineers building Salyut and Skylab shared concerns about size, shape, weight, and strength. Protection from micrometeors, insulation from extreme temperatures, and how to attach many of the external components also consumed engineers from both nations. Other teams focusing on the interior of space stations had concerns about how astronauts would live and perform their experiments. The interior space had to be designed to accommodate as many as three astronauts, along with supplies of food, water, and oxygen to last for many months. The interior space also had to accommodate occupants' need for sleep, exercise, hygiene, and personal privacy—this in addition to space for conducting several experiments involving a variety of scientific devices. Still others worked to solve problems involving the generation of electricity, keeping the interior spaces clean and safe, and taking into account unique problems that working in a weightless environment presented. The architecture of both Salyut and Skylab were similar in that they both consisted of a single large cylinder within which crews lived and performed their experiments. Orbiting Earth at roughly 250 miles in space, these laboratories required relatively little structural reinforcement because their orbits placed them in a vacuum where pressure was negligible. Furthermore, although the craft would orbit Earth at about 17,000 miles per hour, there would be no friction of atmosphere to tear away external equipment. Secondary components necessary for sustaining the crew and supporting their scientific activities, therefore, were attached to the exterior surface of the spacecraft. As a result, both Skylab and Salyut would be anything but streamlined. Other alterations to the basic cylindrical shape were also necessary. For example, a device known as a multiple docking adapter was needed that would firmly lock transport vehicles in place. To allow crew members to exit and reenter for space walks, technically called extravehicular activities, an airlock module, capable of accommodating one crew member at a time, was attached. Each space station would carry one or more externally mounted telescopes, to be used for photographing the Sun and other objects in the solar system. Externally mounted antennae would receive and send radio signals. And to provide the stations with electricity, multiple solar panels would reach outward. On Skylab, the four solar panels, each forty-eight feet long, would collectively look like the blades of an old-fashioned windmill. Although both space stations were bulky and relatively heavy, one focus of their design was compactness. Both Salyut and Skylab were assembled on Earth, tightly packed into the cargo bay of a single rocket, and then blasted into orbit. To accomplish this feat, parts of the space stations were folded before insertion into the cargo bays. Then, when they were released in space, the folded parts were meant to unfold. Space aboard the launch vehicle was, therefore, at a premium. As a consequence neither the United States nor the Soviet Union sent crews on the rockets carrying the space stations. Instead, it was expected that crews would be sent once all components had safely deployed and the stations had stabilized in their respective orbits. Engineers realized that the space station envisioned was far too large to place in orbit with the boosters then available. Therefore, the interiors of Skylab as well as Salyut were designed to optimize precious usable space. The tons of scientific equipment, food, water, and personal effects of the crews meant that every cubic millimeter of space would be needed. Years prior to launch, when engineers were still designing the stations, they sketched to scale every item that would go aloft to ensure that it would actually fit. Since astronauts in a weightless environment occupy all three dimensions of a room as they float from place to place, artists familiar with human anatomy were employed to sketch in astronauts to ensure they would have adequate room to maneuver. Engineers also weighed every item to within the accuracy of one gram to verify that the fully loaded space station would not be too heavy for the rocket to lift it to the proper orbit. Skylab, with an overall length of 118 feet and a diameter of 22 feet, had an interior volume of roughly 10,000 cubic feet, the equivalent of a small house. Divided into two stories, Skylab was designed for a work laboratory on the upper story, which occupied 38 percent of the interior, with the larger lower story for living quarters. This lower story was subdivided into a wardroom (used for dining and exercise), sleeping compartments, and an enclosure housing a shower/toilet. Since interior space was at a premium, creative approaches to its use were encouraged. For example, aboard Skylab all tables and many other horizontal surfaces were designed to be folded up against the walls when not in use to make room for larger experimental apparatuses. Even the shower facility folded up. To conserve space, clothing for all astronauts was vacuum sealed, compressed, and stowed in special containers. No anticipated condition occupied more time and required more engineering considerations than that of weightlessness. In designing interiors, engineers had to take into account that everything not secured in some way would be floating. In such an environment, astronauts could not work effectively if they had to contend with floating objects. To control the interior, designers fabricated special tie-downs for commonly used objects, some wall space was lined with Velcro to which tools and other objects could be quickly attached, and all containers had to have covers to prevent objects from floating away. Gravity is a force that governs motion throughout the universe. It holds all things to the ground, keeps the Moon in orbit around Earth, and Earth in orbit around the Sun. Many people mistakenly think that astronauts on the space stations are in a zero-gravity environment high above Earth and this is why they float throughout space stations along with their pens, paper, and anything else not tied down. Nothing could be further from the truth. According to physicists who understand the mathematics of gravity, an apple falling from a tree on Earth would also fall to Earth if the tree were stationary 250 miles out in space, where most space stations orbit. The gravitational field is still quite strong there, roughly 95 percent of what it is on the surface. Why, then, do space stations not crash to Earth, and why do astronauts appear to be weightless in their cabins? Weightlessness can be created two ways. One way is to travel millions of miles from any large object, where the gravitational pull diminishes to the point where it is very small. The second way, and a much more practical method, is to create a weightless environment through the act of free fall. Free fall occurs temporarily on Earth on roller coasters that crest and then suddenly drop down the rails or on airplanes that temporarily execute a steep dive. The same principle is used on space stations. Physicists explain that just like the roller coaster and the diving plane, space stations are in a constant state of free fall. The key to maintaining them in a constant free-fall state is to keep the space stations traveling at just the right speed and right altitude—17,000 miles per hour and 250 miles up. Given these two conditions, space stations will perpetually fall around the revolving Earth; their orbits are curved and parallel to Earth's surface, not straight. As long as the speed and altitude remain constant, they will remain in a perpetual state of free fall. On board the space station, the astronauts are also falling; it just does not look like they are. That is because they are falling along with the space station. Since they are falling at the same rate as the space station, which is constant free fall, they appear to float in the state that physicists call weightlessness. 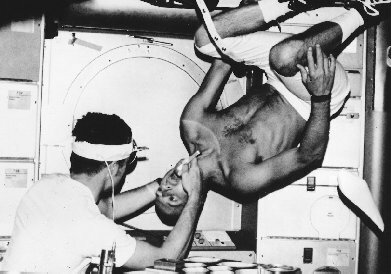 Even routine activities like a medical exam are a challenge in a weightless environment like that found on the space station Skylab. Designers had to anticipate that the contents of containers would behave differently in orbit than on Earth. Carbonated soft drinks, for example, are particularly problematic because in a weightless environment bubbles of carbon dioxide remain randomly distributed in the fluid rather the rising to the top. The result can be a foamy mess when an ordinary can is opened. By dispensing carbonated soft drinks in a collapsible bag instead of a bottle, however, the pressure around the fluid can be constantly controlled, preventing a messy explosion. The engineers also had to design interiors with weightlessness in mind. Moving from compartment to compartment through tight hatches or down narrow corridors while weightless meant that a strong push from a leg or arm might send an astronaut colliding with walls. To lessen the dangers of bumps, bruises, or worse, hatches were padded, as were the walls of corridors. To assist crew members moving about and to help them stay put when they wished to do so, some walls and ceilings were fitted with a metal triangular grid work. Shoes designed for the astronauts had triangular plates fastened to the soles that would fit through the triangular opening in the grid. By turning one foot slightly, an astronaut would be able to hold steady while working. There were also other means of restraint. One was a set of straps similar to those on beach sandals. Three pairs of these were placed on the floor of the wardroom at the base of the food table; another pair was located in the waste management compartment, where garbage was collected, sorted, and sealed; and yet another pair was installed in front of the toilet. Still another type of foot restraint, for use with the heavy boots of space suits, consisted of toe bars and heel fittings which would be fastened to floors and walls of the airlock that astronauts used before exiting on space walks. Performing the many scientific experiments while weightless also presented unique problems. Some experiments required the assembly of an apparatus involving hundreds of small parts such as tiny screws, nuts, and bolts. If a container of small parts was accidentally shaken or bumped, setting in motion dozens of small parts, progress came to a halt until all the parts could be rounded up and counted. In time, astronauts on both space stations learned that air currents, created by ventilation fans within the space stations would carry most lost objects to a filter, where they could easily be retrieved. A greater hazard to the safety of crews were liquids lost and floating throughout the space stations. When liquids got loose from their containers, they often broke into thousands of tiny droplets, which then dispersed throughout the interior. Although each space station had small devices for vacuuming up liquid spills, there was always the danger that a liquid might slip into electrical wiring and short out critical components. In an outpost orbiting more than two hundred miles above Earth, the one critical commodity needed in large supply that could not be packaged and flown into orbit was electricity. Although large batteries were once considered, they were quickly rejected for long-term flights because their excessive size and weight made it impractical to send them into orbit. Instead, engineers worked to utilize and improve upon the existing technology for converting solar energy into electricity, a process known as photovoltaic generation. The principles of converting light to electricity had long been known, and the technology for manufacturing photovoltaic cells had been developed by the 1950s. Although they were relatively inefficient at that time, by the 1970s photovoltaic cells themselves had improved significantly, as had wiring, which significantly reduced loss of electrical current. Because of these improvements, the problem of supplying electricity to space stations was solved. In fact, the most distinctive external feature of both Salyut and Skylab was their array of solar panels that stretched outward to capture the Sun's rays. These panels consisted of thousands of thumb-sized silicone chips that directly converted sunlight into electricity. Both Skylab and Salyut deployed about one thousand square feet of panels to produce the 120 volts of direct current needed to run the hundreds of small motors, compressors, lights, computers, refrigerators, and navigation and communications systems. Since sunlight was the necessary ingredient, electrical generation could only occur when the photovoltaic panels were bathed in sunlight. Onboard computers controlled the panels' orientation by firing small rockets to slightly change the orientation of the spacecraft to maximize exposure to sunlight yet avoid overheating the interior of the spacecraft. Since all space stations circle the globe sixteen times a day, there were sixteen times daily when Earth obstructs sunlight. During those dark moments, space stations would have to rely on batteries to supply power. In spite of unbridled enthusiasm shared by the United States and the Soviet Union for their first attempts to establish space stations, initial attempts were fraught with problems. No one involved was especially surprised because everyone understood that the technical leaps being made were large and that many of them were untested. The first test of space station technology was Salyut 1. Two days after Salyut 1 was sent into orbit, on April 23, 1971, the transport vehicle called Soyuz 10 docked to deliver the first three Soviet cosmonauts. As the three saw their space station coming into view, they maneuvered the nose of their vehicle into a five-foot-diameter docking port to establish the initial "soft" docking. The two craft coupled flawlessly, but when the cosmonauts then attempted the "hard" docking to secure and hermetically seal the two vehicles together with interlocking steel collars, the locking mechanisms failed to properly mate. Following six hours of frustration high above the earth, the cosmonauts withdrew from Salyut 1 and returned home later that same day. 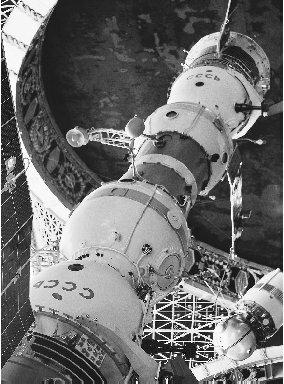 Undaunted by what the Soviet space agency described as a partial success, engineers made mechanical adjustments to the steel collar and a second attempt to dock with Salyut 1 took place on June 6 of the same year. This time the docking was successful, and television cameras transmitted pictures of the first men to inhabit a space station turning somersaults as they entered their new home. The schedule called for the men to inhabit the station for thirty days while performing a variety of experiments, undock on July 6, and return home. Over the next eleven days, life on board Salyut had become a predictable routine, and most observers believed that the mission would flawlessly continue. Suddenly, however, on June 18 a small electrical fire in one of the thousands of electrical cables broke out. The three men retreated through the docking port to their return vehicle and requested permission to terminate their mission and return home. Ground command, however, provided directions for extinguishing the fire, and the men returned to Salyut and successfully performed the task. Unfortunately, this unforeseen event shook the men's confidence, impairing their ability to complete the thirty-day mission. On June 29 ground control made the decision to bring the three men home ahead of schedule. The television cameras recording their departure captured their relief to be returning home as they laughed and joked about the electrical fire that had at one time placed their lives in peril. Launched April 23, 1971, the Soviet Union's Salyut I was the first space station to orbit Earth. Soviet cosmonauts docked with the station two days later. the speed of Soyuz 10 dropped from seventeen thousand miles per hour to three hundred miles per hour by the time the vehicle was at an altitude of ten thousand feet. At that point the three parachutes deployed and softly deposited the capsule back on Earth at the precise predetermined spot. The only hint that something might be wrong was an unexpected loss of communications. The recovery team gathered around the capsule and unbolted the hatch to give the three cosmonauts a heroes' welcome, but it was shocked to discover all three silently sitting motionless upright in their seats. All three were dead. An inquiry into the tragedy revealed that a hatch valve was either opened or jolted open when the descent vehicle separated from Salyut. The open valve allowed the precious supply of oxygen to escape into space. The valve would normally have opened as the spacecraft descended through the lower levels of the atmosphere, equalizing the pressure inside and outside of the spacecraft. Opening prematurely in space, however, proved fatal. American engineers, as they completed preparations for the launch of Skylab, studied the fatal failure of Salyut and paid careful attention to its many problems. Nonetheless, Skylab's early history was a rocky one, although no astronauts lost their lives. On May 14, 1973, the unmanned Skylab station was catapulted into space on its maiden voyage by a Saturn 5 rocket. All systems performed flawlessly until sixty-three seconds into the launch, when controllers received an unexpected signal from Skylab indicating that the station's critical micrometeoroid shield had deployed—while still stored inside the rocket ship. Apparently vibrations during launch had caused the delicate shield to tear and prematurely deploy. The micrometeoroid shield was a critical component for two reasons. First, it was intended to protect Skylab's workshop wall against penetration by micrometeoroids speeding through space. Such tiny objects were common, so the danger they presented was real. Secondarily, the shield was designed to provide shade while Skylab was exposed to the direct rays of the Sun. Without the shield, the space station would rapidly overheat. Of equal concern was the damage the shield did to other components when it deployed. When Skylab was released from the rocket bay and allowed to drift free, engineers on the ground discovered the true extent of the problem. When the shield opened prematurely, it not only tore, but it also ripped away one of the craft's solar panels. With only three solar panels left, ground engineers needed to maneuver Skylab to face the Sun so as to generate as much electricity as possible. Because of the loss of the micrometeoroid shield, however, this repositioning caused internal temperatures to rise to 160 degrees Fahrenheit—far too hot for humans to endure. 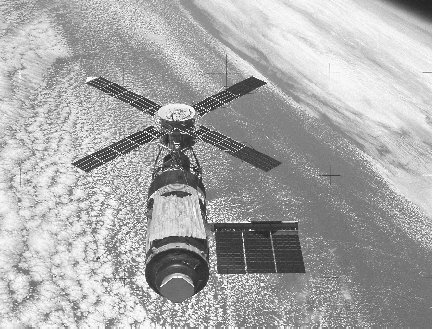 The crew remained on the ground; meanwhile, Skylab was in a crisis. On the one hand, excessive heating could spoil food and film and could cause insulation to give off poisonous fumes. Lack of electricity, on the other hand, would cripple the workshop and other critical electronic equipment such as computers and navigation systems. Without a resolution, ground crews would be forced to scuttle the entire project. Skylab orbits Earth with the metallic parasol (bottom) that replaced the damaged micrometeoroid shield. The space station fell out of orbit in 1979 after three missions. everything and everybody we have who can do anything." 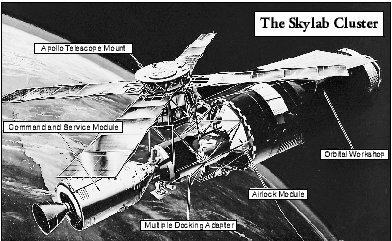 6 The agreed-upon solution was to maneuver Skylab by remote so that its working solar panels were at a 45-degree angle to the Sun. This compromise reduced interior temperatures to a safer 122 degrees Fahrenheit but still generated some electrical current. On May 25 the three-man crew went up to begin repairs. One task involved deploying a makeshift metallic parasol, after which the temperature dropped dramatically. Now Skylab could be turned to expose the solar panels to more of the Sun's rays to increase electrical generation. These successful repairs allowed the crew to spend twenty-eight days at the station followed by two subsequent crews for an additional fifty-nine and eighty-four days, respectively by the end of 1973. The results of the troubleshooting by engineers on the ground and improvisations by astronauts on Skylab produced 171 days of operation that satisfied the American engineers who designed it and the scientists who had an opportunity to conduct experiments. A total of 117,000 photographs were taken of the Sun, showing extraordinary details of the solar surface, close-ups of sunspots, and the violent solar winds that can sweep across the massive hot solar surface. The store of information captured in space exceeded what had been amassed in the previous hundred years of study from the earth's surface. Earth had also been the subject of constant observation, resulting in forty-six thousand photographs. Meteorologists, oceanographers, and biologists scrutinized every one for any detail that might add new information about the general health of the planet and any signs of environmental stress. Added to these photographs were additional databases of information, the results of hundreds of hours of experimentation in material sciences, biology, and space medicine. Above all, the study of the response of astronauts' bodies, to prolonged periods in a weightless environment met one of the most important objectives of the Skylab program, simply to confirm that humans could survive in space for prolonged periods. Skylab fell from orbit in 1979 following just three missions, totaling 171 manned days. Salyut 1, meanwhile, was followed by a succession of six space station launches, each bearing the Salyut name. The combined lessons learned were of inestimable value. Most of all, confidence in the combined problem-solving capability of ground crews and astronauts was sufficient to move both the United States and the Soviet Union forward toward more ambitious missions requiring more sophisticated space stations. Would you be so kind to correect Soyuz designation from 10 to 11 when you are speaking about second Salyut mission, please?